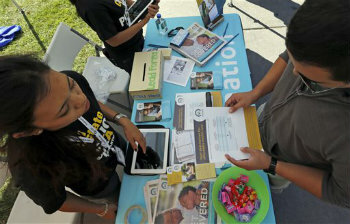 Lagging enrollment in PPACA among Californias Latinos is spurring a new push into communities to sell the states program face-to-face. Feb. 14 (Bloomberg) — Lagging enrollment in PPACA among California’s Latinos is spurring a new push into communities to sell the state’s program face-to-face. Many low-wage Latinos fear that going on public assistance could harm their efforts to become U.S. citizens, or enrolling could lead to the deportation of undocumented relatives who live with them, according to community activists. At the same time, glitches on the insurance exchange website and a lack of Spanish-speaking counselors on its telephone banks aren’t helping, they say. The result: Through Dec. 31, Hispanics made up just 20 percent of those who have enrolled in California and identified their ethnicity. That flies in the face of the fact that almost half of California’s Latinos are eligible for subsidies under Obamacare. With a March 31 deadline looming for mandated insurance coverage, a new push has begun to sell the program in community centers, instead of through the state’s exchange website or telephone lines. Nationally, about 10.2 million uninsured Latinos are eligible for health coverage under the Patient Protection and Affordable Care Act of 2010. They represent 25 percent of the 41.3 million uninsured nonelderly U.S. citizens and other living legally in the United States. In California, they make up about 57 percent of the 6.7 million uninsured. They are important to the success of Obamacare both because of their growing political clout and the fact that they’re younger and healthier as a group than the uninsured generally. That makes them less costly to insurers aiming to offset medical payments for older enrollees while keeping premiums low. Covered California, which recently secured a $155 million federal grant, is planning to add 350 representatives, including bilingual workers, to its service center by the end of March, with about 250 beginning training this week. The organization has also sent a million mailers to homes, with the vast majority going to Spanish-speaking families, Lucero said. Daniel Zingale, senior vice president at the California Endowment, a Los Angeles-based health foundation, said the ongoing effort to recruit Latinos is important both to the state, and to the message being sent out nationally. The biggest problem is that “a lot of people, new immigrants to this country, have a mistrust of government, particularly when they see families being divided and deported,” Zingale said. Under the law, undocumented immigrants can’t get coverage. It also requires that those seeking coverage state their immigration status and provide information about members of their household to determine eligibility. A link reading “Don’t fear if you are undocumented” on Covered California’s Spanish-language website connects to a page that explains this policy and connects to the memo. Still, there remains “a great deal of suspicion about talking to the government” at a time when problems with the Covered California website, long wait times on the Spanish- language line to enroll by telephone and a shortage of Spanish- speaking counselors remain an issue, Zingale said. Juanita Chavez, 43, a development associate from Bakersfield, California, said she began trying to enroll in a health insurance plan on the Covered California website in October. She got stick after it wouldn’t let her continue unless she added a family member for coverage even though she didn’t have anyone to add. Chavez, who has autoimmune hepatitis and had a liver transplant in 2001, put her application on hold and tried calling the helpline. There she experienced long wait times or a recording saying the lines were busy and to call back later. Chavez, who supports Obamacare, finally got through to the call center in early January and enrolled for a plan after an hour-and-50-minute wait. She later found out she was ineligible for Covered California coverage because her work offers health insurance. She said she thought she had a choice between Covered California and her work plan. Her work plan doesn’t let her stick with her existing doctors. “They need to have more staff and they need to fix the website and make it easier to use,” Chavez said. Nationwide, challenges in enrolling Hispanics also include a lack of access to computers, low-income families who can’t afford the monthly premiums and states that aren’t expanding Medicaid, said Steven Lopez, senior health policy analyst at National Council of La Raza, a Washington-based Hispanic advocacy group. Mayra Alvarez, associate director at the office of minority health at the Department of Health and Human Services, said California isn’t alone in struggling with the best ways to bring Obamacare to Latinos. A third of Latinos in the U.S. don’t have access to health insurance, half don’t have access to a doctor and a quarter are eligible for Obamacare, she said. While Alvarez said her agency doesn’t have numbers on how many Latinos have enrolled because applicants aren’t required to report their ethnicity, she’s aware that extra effort is needed. Informing Latinos about the program has involved having to explain co-pays, premiums and the other mechanics of insurance plans, Alvarez said in a telephone interview. At La Loma Medical Group in Oakland, a board hanging on the wall of the waiting room features the number of days until the March 31 enrollment deadline and information in Spanish on how to enroll. The office’s medical assistants make calls every day from 4 p.m. to 8 p.m. five days a week to Spanish-speaking uninsured patients, urging them to enroll, said Esteban Lovato, a doctor at the practice who is behind the effort. He said the state has failed at reaching enough Latinos. “We’re just picking up the slack and doing our part to at least get the word out to our own people who are part of our practice,” Lovato said in an interview. His office provides minimal-cost basic care for low-income patients, 90 percent of whom speak Spanish. Inside one of the exam rooms at La Loma hangs a sheet outlining the income limits to qualify for Medicaid through Obamacare, which was expanded to childless, single adults ages 19 to 64. Lovato said it’s there to help point out to his patients that a single-person household earning less than $15,856 would qualify for the federal health insurance program for the poor. “To me, it would be a tragedy to have people who qualify – - especially for the Medi-Cal portion, which is free — not sign up and then have some complication in the next eight months,” Lovato said. Latinos represented 32 percent of 584,000 Covered California applicants found likely eligible for Medi-Cal, California’s version of the program, since Oct. 1, according to the California Department of Health Care Services. The prevalence of low-cost clinics like La Clinica de La Raza, an Oakland-based group of 32 community health centers, and La Loma that don’t check the immigration status of their patients may also be deterring Latinos from applying for Obamacare. Still, the health centers typically provide only basic care and don’t offer more costly procedures, such as colonoscopies or emergency care. “If you get hit by a car as you walk out of here, you’re going to want to have that coverage,” said Jane Garcia, La Clinica’s chief executive officer.